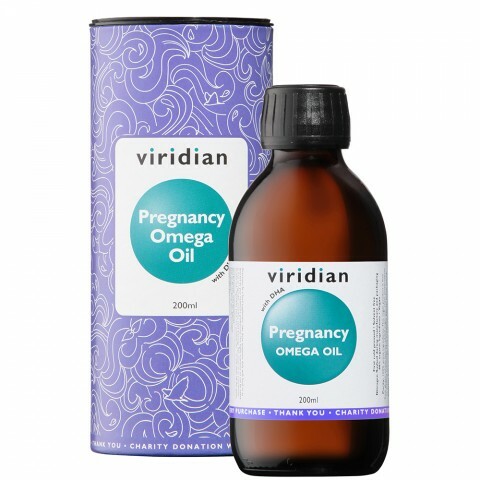 Omega oil for use during pre-conception, pregnancy, postnatal and while breastfeeding. Formulated by experts in mother & baby nutrition. Recommended for pre-conception, pregnancy and postnatal, especially while breastfeeding. Take daily alongside Viridian's Pregnancy Complex Veg caps for the optimum in mother and baby nutritional support. This nutritional oil is 88% organic. DHA contributes to the maintenance of normal brain function and vision. Organic golden flaxseed oil 68%, Organic hemp seed oil 15%, Rice Bran natural oil 9%, Organic avocado oil 5%, Cranberry seed oil 1%, DHA (docosahexanoic acid) 2%, Alpha linolenic acid (Omega 3) 1959mg, Linoleic acid (Omega 6) 1000mg, Oleic acid (Omega 9) 910mg, DHA per 15ml serving 273mg. Directions: As a food supplement, take three teaspoons daily with food, or as directed by your healthcare professional. This highly nutritious oil can be added to fruit or vegetable smoothies, salad dressings, dips, soups or as a condiment drizzled over vegetables, pasta, rice, potatoes etcÉ or just taken off the spoon.